This visa may look like an ordinary piece of shiny, government issued identification to you, but to me it represents a long, arduous journey. A process rife with lengthy email exchanges between myself and the Paris rep at my university's office of overseas studies, my first solo trip on the LA Metro to get various forms notarized, and many pleading texts and phone calls in which I begged my friends and family to drive me in the rain to the LA Consul General for my Visa appointment. 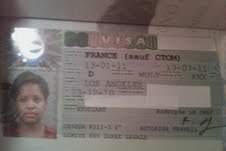 More than the pain, however, this Visa represents triumph. For someone who barely got her college applications in on time, this represents a major feat of organization and time management which, frankly, I wasn't sure I was capable of before this whole process. Go Zee. These two books-one chock-full of useful tidbits and another that I'm going to fill with "useful tidbits" of my own-are more than likely going to be my best buddies during my stay in France. I like the idea of being able to remember moments through little triggers, the way that the scent of my mom's "In Love Again" by Yves Saint Laurent perfume always reminds me of family trips to Chicago. These two books will always remind me of the spring of 2011 and my semester abroad in Paris. The guidebook, Let's Go Paris: The Student Travel Guide , is literally one of the most useful books I've ever read. Not only to does it tell you what documents to bring, but it also warns you about which sketchy metro stops to avoid and where you can get delicious chocolate mousse at a prix fixe. It even gives suggestions as to what to bring your host family as an appropriate "thanks-for-letting-me live-in-your-house-and-murder-your-language" gift. The book suggests Girl Scout cookies or "noncommercial US honey." Girl Scout cookies would be a legit gift ( I was a Girl Scout myself, after all), but I think they're out of season, and honey is just...boring. I was thinking perhaps a bag of good, ole' fashioned South Carolina grits (non-southern peeps: google it.) My sister suggested an American staple: the snuggie. It's definitely a gift that symbolizes the U.S., though perhaps not in the best light...I'll keep you guys posted on what I decide, and feel free to hit me up with any suggestions! In order to prepare myself for la vie francophone, I've started reading everything french that I can get my hands on. French fashion blogs, Le Monde on my smartphone, I've even converted my Facebook to french. To augment my education on everything "french", my sister has taken it upon herself to educate me on the finer points of classical art. Her main teaching aid: the wonderful Ovation channel. Art and french language opportunity collided when she noticed that the movie The Little Prince was playing earlier today. The Little Prince by Antoine Saint-Exupery (or Le Petit Prince for you francophiles) is a short book about an alien prince who meets a stranded pilot in the Saharah desert, and his journey through the galaxy to find knowledge. Along the way, he learns about the human condition and his own feelings regarding his homeplanet and the rose that lives there, whom he loves. For me, this book has always represented stress and failure. In high school, my french teacher assigned this book to my class and my memories of it are marked by short, comprehension-less readings punctuated by frequent consultations of my french-english dictionary. Empowered by my impending trip to France and my increased knowlege of the language, I sat down with my sister to watch the movie: clutching my trusty Larousse french-english dictionary and my stolen copy of Le Petit Prince. The movie, which had been adapted into a musical, was incredibly campy and dated, yet I found myself crying at the end when the prince draws the bite of the snake in order to return to his planet and his beloved rose. The tears started welling up even before then , when the prince meets a fox, played by the incomparable Gene Wilder of Willy Wonka and the Chocolate Factory fame. After walking through a rose garden, the prince becomes sad when he realizes that his rose is not unique. He thinks that this reflects poorly on his princely-ness, and starts to cry. He then happens upon the fox, who invites him to tame him. The process of taming that the fox describes sounds remarkably similar to that of how people fall in love: showing up in the spot where you know you'll see that person, the anticipation that you feel, slowly getting closer and closer to that person, until you are united. One day, the prince realizes that his rose is still special because he has cared for her and loved her. He loves her because elle est sa rose (she is his rose). The prince tells the fox that it is time for him to go, and the fox cries because the fox has been changed by his interaction with the prince, and will miss him terribly. From this scene, I drew two main points. First, that when we engage with other people, get close to them, and get used to seeing them, when they leave, or when we leave..it hurts and it's unavoidable. Second: even when there are other "roses" out there who seem to be the same, to someone you are special because of the time that they have spent being with you, caring for you , protecting you. And I think that's beautiful. I'm glad that I finally finished the book and that I shared that experience with my sister. Maybe if I had known the book had had such a profound message in high school I would have tried harder to finish it, though honestly I don't think that it would have resonated with me then as it does now. As excited as I am to be going to study abroad, I can't help but think about those I'm leaving behind, and sometimes wonder if they're thinking about me too. Hi there! I'm "Zee", welcome to my blog! I started this blog to keep my family and friends abreast of all of my Paris-related adventures while studying abroad. Now, I have expanded it to share my favorite recipes, experiences, and other cool stuff. Hope you enjoy! Outta my way, protesters. "Cézanne"n't you see I'm trying to get to a museum?! © Azeezah Goodwin and laviedezee.com, 2018. Unauthorized use strictly prohibited. Simple theme. Powered by Blogger.